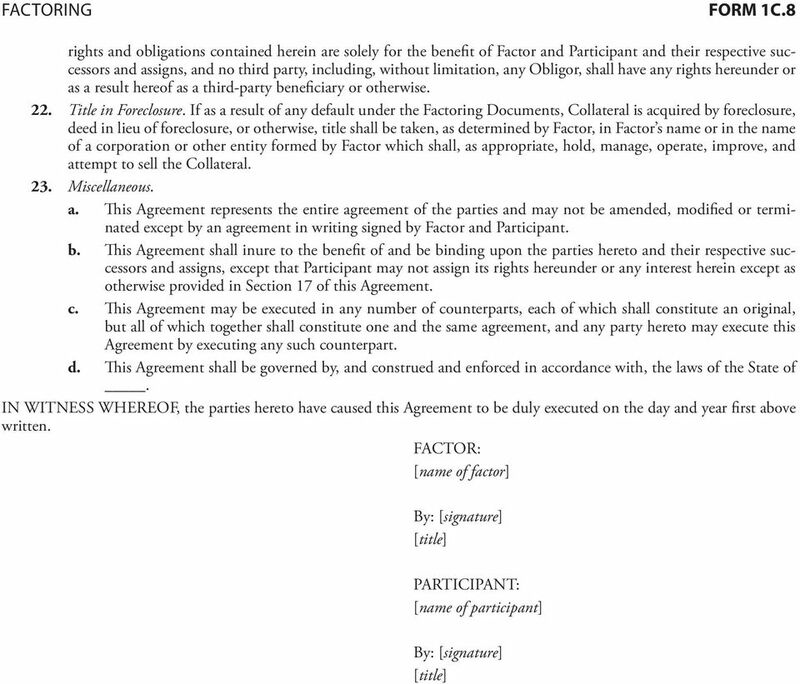 Download "FORM 1C.8 PARTICIPATION AGREEMENT"
1 1C.8 FACTORING FACTORING FORM 1C.8 FORM 1C.8 PARTICIPATION AGREEMENT THIS FACTORING PARTICIPATION AGREEMENT ( Agreement ), made and entered into as of the day of, 20, by and between ( Factor ) and ( Participant ); WITNESSETH: WHEREAS, Factor has entered into a Factoring Contact and Security Agreement, dated, 20 (such Factoring Contract and Security Agreement, as heretofore or hereafter supplemented or amended from time to time, being herein called the Factoring Agreement ) with ( Client ), pursuant to which Factor purchases certain of Client s accounts receivable and, upon Client s request, makes advances (individually, an Advance and, collectively, the Loan ) at its discretion against the purchase price of such accounts receivable prior to collection; and WHEREAS, Factor and Participant have agreed that Factor shall sell to Participant, and Participant shall purchase from Factor, an undivided ownership interest in each Advance made pursuant to the Factoring Agreement, upon the terms and subject to the conditions set forth in this Agreement. NOW, THEREFORE, for good and valuable consideration, the receipt and sufficiency of which is hereby acknowl edged by each party hereto, the parties hereto, intending to be legally bound hereby, hereby agree as follows: 1. Definitions. As used in this Agreement, the following terms shall have the following meanings (such meanings to be equally applicable to both the singular and plural forms of the terms defined): Advance has the meaning ascribed to such term in the recitals hereto. Approved Receivables means the Receivables purchased by Factor from Client under the Factoring Agreement which have been approved by Factor as to credit risk and terms of sale. Business Day means a day other than a Saturday, Sunday or other day in which banks are authorized or required to close under the laws of the State of. Client has the meaning ascribed to such term in the recitals hereto. Collateral means the Receivables and all other property securing repayment of the Loan. Collections means (i) all payments received by Factor from or on behalf of Client, from any source, under or in connection with the Factoring Documents; (ii) the net amounts credited to Client by Factor pursuant to the Factoring Agreement as the purchase price of Approved Receivables; (iii) all payments received by Factor on any guaranties which are or may be applicable to the payment or discharge or the Loan; and (iv) all payments received by Factor from the sale or other disposition of any Collateral. 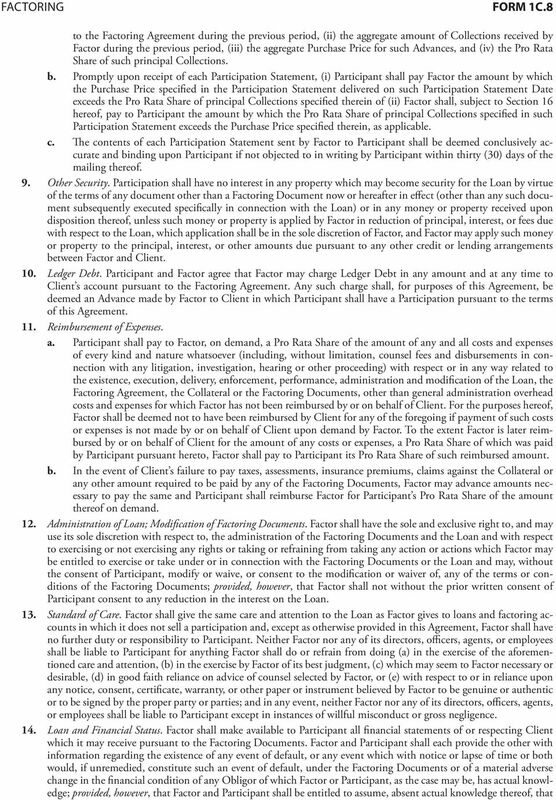 Factoring Agreement has the meaning ascribed to such term in the recitals hereto. 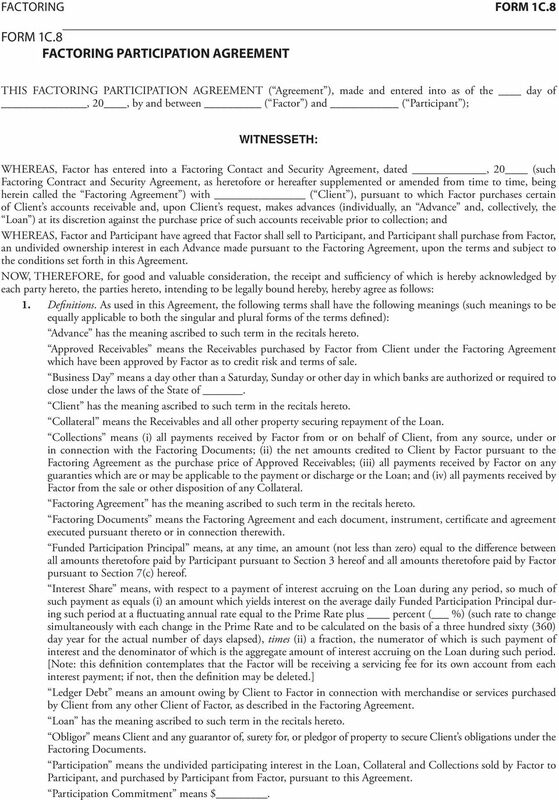 Factoring Documents means the Factoring Agreement and each document, instrument, certificate and agreement executed pursuant thereto or in connection therewith. 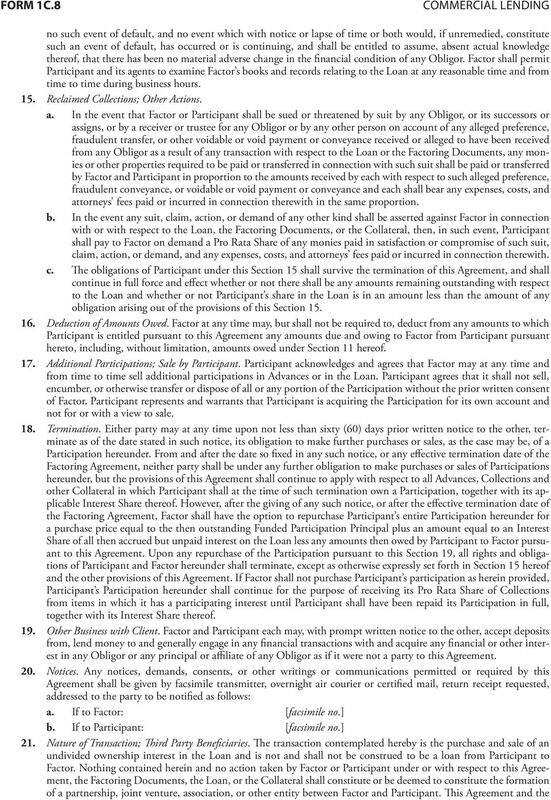 Funded Participation Principal means, at any time, an amount (not less than zero) equal to the difference between all amounts theretofore paid by Participant pursuant to Section 3 hereof and all amounts theretofore paid by Factor pursuant to Section 7(c) hereof. Interest Share means, with respect to a payment of interest accruing on the Loan during any period, so much of such payment as equals (i) an amount which yields interest on the average daily Funded Participation Principal during such period at a fluctuating annual rate equal to the Prime Rate plus percent ( %) (such rate to change simultaneously with each change in the Prime Rate and to be calculated on the basis of a three hundred sixty (360) day year for the actual number of days elapsed), times (ii) a fraction, the numerator of which is such payment of interest and the denominator of which is the aggregate amount of interest accruing on the Loan during such period. [Note: this definition contemplates that the Factor will be receiving a servicing fee for its own account from each interest payment; if not, then the definition may be deleted.] Ledger Debt means an amount owing by Client to Factor in connection with merchandise or services purchased by Client from any other Client of Factor, as described in the Factoring Agreement. Loan has the meaning ascribed to such term in the recitals hereto. Obligor means Client and any guarantor of, surety for, or pledgor of property to secure Client s obligations under the Factoring Documents. 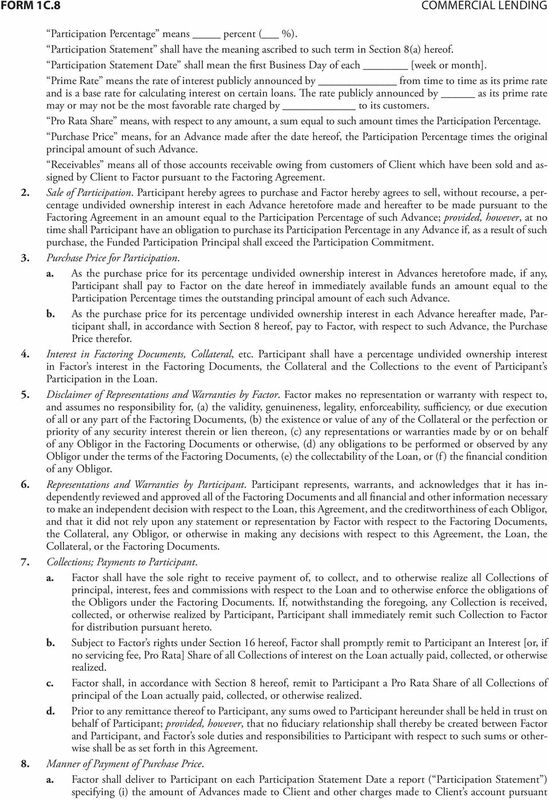 Participation means the undivided participating interest in the Loan, Collateral and Collections sold by Factor to Participant, and purchased by Participant from Factor, pursuant to this Agreement. Participation Commitment means $. FACTORING AGREEMENT. THIS FACTORING AGREEMENT made and executed the day of Acceptance by and between the Client and LoyalCash Corp. (the Factor ). FOREXer Advisory ADVISORY AGREEMENT. Last update of this DisclosureDocument is Aug 1 st, 2013.